I was looking forward to this novel as I liked Shapiro’s previous novel, The Art Forger. 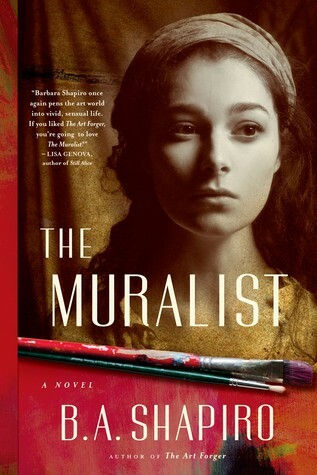 An easy and fun read, The Muralist is split into a dual narrative, set in present day and in the 1930’s. If you’re a fan of historical fiction, featuring real people, you’ll love the 1930’s narrative. Guest appearances include: Jackson Pollock, Mark Rothko, Lee Krasner, and, Eleanor Roosevelt. Through this narrative, we learn a lot about the real historical people, and the events and circumstances of 1930’s America. Although entertaining, this story did tend to gloss over some important parts of history, and, seemed to sometimes name drop for the sake of it, although an argument for entertainment value can be made to support this stylistic choice. Generally speaking though, the characters were entertaining and somewhat fleshed out, and they definitely helped the development of the plot. This is definitely a sit back with a glass of something and read sporadically throughout the week, kinda book. You can put it down and pick it back up without having to re-read chapters. I recommend it if you’re a fan of historical fiction, dual time narratives, and fun characters. Be warned though, you may well spend more time researching the real events and characters, than reading the book! Learning is never a bad thing though, so pick yourself up a copy, sit back, get a glass of your favorite tipple, and immerse yourself into Shapiro’s world.